Backed by Midnite on this second album, rising star from St. Croix Dezarie presents a soulful collection of instant hits of conscious, 70's roots reggae. The record is mostly one drops, downtempo groovy reggae, and nearly any of the 12 tracks could fit nicely in a rootsy mix! A perfect gift for some sensual awakening of your girlfriend. 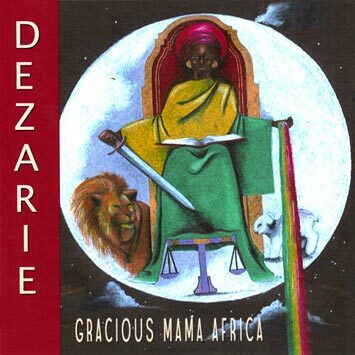 Roots empress Dezarie has blessed the reggae community with the deliverance of her newest recording "Gracious Mama Africa". Released on the Afrikan Roots Lab record label, this album emerges from the seeds planted on her amazing debut album of 2001 "FYA". Gracious Mama Africa transports the incredible voice of Dezarie to a whole new level - the highest heights. Her foundation is firmly established in songs such as "Travelers" and the title track. The brilliance and clarity of Dezarie's voice is reverently unveiled on "Exhalt". Gracious Mama Africa abounds with pleas for social justice and racial equality with selections like "Poverty", "Strengthen Your Mind" and "Justice". But to this listener, the strength and power of Dezarie is most strikingly displayed in her condemnation of so-called civilization. "Gone Down", "Not One Penny", "Law Fe De Outlaw", "Slew Dem An Done" and "Judgment Come" all deliver conscious punches that penetrate the soul. After receiving Atlanta's "Best New Female Reggae Artist" award in 2001, Dezarie returned to her native island of St. Croix. Since that time, she has been working closely with Midnite, the players of instruments for "Gracious Mama Africa". Midnite's trademark sound is fully displayed on this album. Momentous bass lines from Phillip Merchant, classic one-drop from Dion Hopkins and the bubbling of Ron Benjamin on keyboards prevail throughout, accentuated by Abijah's charismatic guitar playing. From the excellent overdubs of Dezarie's voice to the flying symbols on "Slew Dem" it is evident that Ron Benjamin worked tirelessly in the production and mixing of this album. The fruits of this labour are eloquently displayed on Gracious Mama Africa which is sure to be one of the best roots albums of 2003.